Fans of the TV series South Park will recognize “Imaginationland” as the three-part episode arc that won an Emmy Award in 2008. It’s also been turned into a game for the iPhone and iPod touch. And though it has the feel of a game assembled by a committee of executives with an eye toward promoting a franchise, South Park: Imaginationland ends up working well as a platform/puzzle game. Oh, Hamburgers: Make Butters bounce and fly to collect rainbow tokens in South Park: Imaginationland. But run into bombs and spikes, and Butters could suffer the same fate as the oft-killed Kenny. 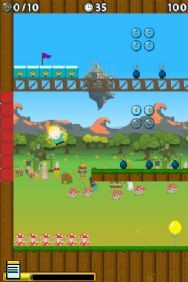 Taking a cue from the classic South Park episode, players help Butters bounce and fly through more than 60 levels while collecting rainbow tokens within a given time limit. Butters also has to avoid traps, such as bombs and spikes. Even if South Park: Imaginationland seems like the product of a corporate directive—the game is published by RealArcade, with the imprint of both Real Networks, and Comedy Central—it’s executed well. Great graphics coupled with good sound and voice acting provide an immersive experience for the player. The controls make the game interesting, and there’s a sense of guesswork to Butters’ movements that makes the game fun. While you can control the characters’ movements to a degree by tilting the handset, you can also bounce off mushrooms or other surfaces to gain Imagination power. Once enough Imagination has been built up, you can use a swiping motion to fling Butters in a controlled direction to help navigate the level. Unfortunately, the game has a few shortcomings. While Imaginationland runs extremely well, the controls feel as if they need work, causing some frustration. Finally, a dearth of sounds leaves Butters yelling the same things whenever you lose a life—it can get pretty tiring. Still, as frustrating as the game can be, it’s easy to return to Imaginationland. A well-designed portion of the game saves your progress, allowing you to quickly pick up from where you left off. A combination of unlockable levels and prizes keeps the player coming back, but there’s a certain hit or miss factor here—South Park fans may love the game while others will probably look elsewhere for gaming fun. Finally, there’s the matter of price. When I bought the game, it sold at a “limited-time” price of $1. While that price remains in effect as of this writing, the game has sold for as much as $10. Whether or not that’s a fair price depends on the hold South Park has on your heart and your DVR. South Park: Imaginationland is compatible with any iPhone or iPod touch running the iPhone 2.x software update.